France’s Vanessa James and Morgan Cipres perform their Short Program at the 2019 European Figure Skating Championships. 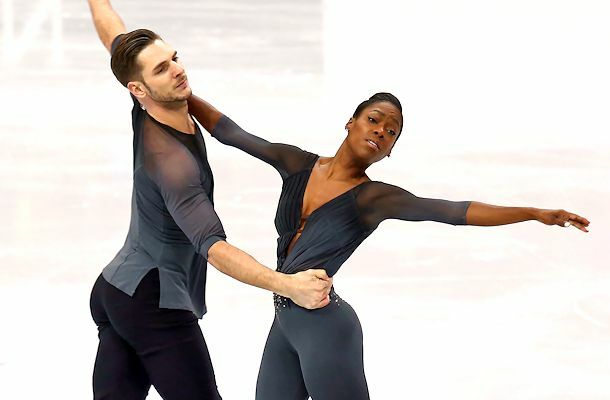 In their eighth appearance at the event, France’s Vanessa James and Morgan Cipres captured the Pairs’ gold at the 2019 European Figure Skating championships. Russia’s Evgenia Tarasova and Vladimir Morozov, the two-time and defending champions, took silver. Teammates Aleksandra Boikova and Dmitrii Kozlovskii edged out Italians Nicole Della Monica and Matteo Guarise for the bronze in their debut at this event. Skating to “Wicked Game,” overnight leaders James and Cipres opened with side-by-side triple toe-double toe-double toes, however, James had a slight touch-down with her hand on the side-by-side triple Salchows. No matter, the 2018 World bronze medalists pushed through, completing a throw triple flip and triple Salchow while displaying level 4 lifts throughout their routine. The team finished first, earning a new season’s best of 149.11 to the delight of James, who screamed with happiness when the scores were revealed. They finished first overall with 225.66 points, improving their bronze-medal win from 2017. They are the first French pairs’ team to win European gold since 1932 when the husband-and-wife team of Andrée Brunet and Pierre Brunet won in Paris, France. “We are indeed happy that we didn’t stop, but kept skating because we finally accomplished our dream after I don’t know how many years,” James added when asked about retiring. Tarsova and Morozov appeared focused in their routine to “The Winter,” and the only error came when she underrotated and stepped out of the side-by-side triple toe-double toe-double toe combination. The two-time European champions were otherwise solid, landing solid side-by-side triple Salchows as well as a huge throw triple Salchow and throw triple loop. All twist and all lifts were graded a level 4 and they earned a season’s best of 144.92 for a second place finish in the free skate and overall (218.82). Boikova and Kozlovskii, who were fourth after the short program, surprised with their routine to The Nutcracker. They landed clean side-by-side triple Salchows, a triple twist, throw triple Salchow, and throw triple loop. However, Kozlovskii struggled on the side-by-side triple toe-double toe-double toe combination. The 2018 Internationaux de France bronze medalists finished third in the free skate and overall with a season’s best of (132.70/205.28). Della Monica and Guarise finished just off the podium by .14 point. Third after the short program, the Italian champions landed solid side-by-side triple Salchows and a level 3 triple twist, but Della Monica two-footed the landing of a throw triple loop. The team also struggled with the side-by-side triple toe-double toes when she put a hand down on the first jump, but they rallied back to land a throw triple Salchow, showing strong level 4 lifts throughout. They scored 131.44 for a fourth-place finish in the free skate and slipped to fourth overall (205.14) in their seventh appearance at this event. Daria Pavliuchenko and Denis Khodykin of Russia landed side-by-side triple flips and side-by-side triple flip-double toe-double toes, but Pavliuchenko took a fall on the throw triple loop. The 2018 World Junior champions otherwise landed a throw triple flip and showed level 4 lifts through to finish sixth in the free skate (120.03) and fifth overall (185.92) in their debut at this event. Germany’s Minerva Fabienne Hase and Nolan Seegert finished sixth overall (180.56), improving from a 12th-place finish in 2017. Austrians Miriam Ziegler and Severin Kiefer who stood in seventh after the short program, withdrew from the free skate citing emotion distress. The team is mourning the death of their coach, Jean François Ballester, who unexpectedly passed away last month.